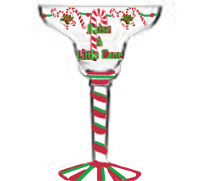 How about a peppermint martini to go in your "Raise A Little Cane" Candy Cane Martini Glass? But even better how about a whole set of hand painted candy cane glasses and dinnerware to delight your Christmas guests and family? We offer a whole "Raise A Little Cane" hand painted collection in dinnerware to all types of glasses. The Red and White stripe will surely be a hit of the season. See all of our matching pieces. These glasses are so festive. They will be a big hit at my Christmas party. Love your work. Thanks so much. The glass is gorgeous!. The glass is very sturdy and the colors make it very festive for the Christmas season. Well done! !